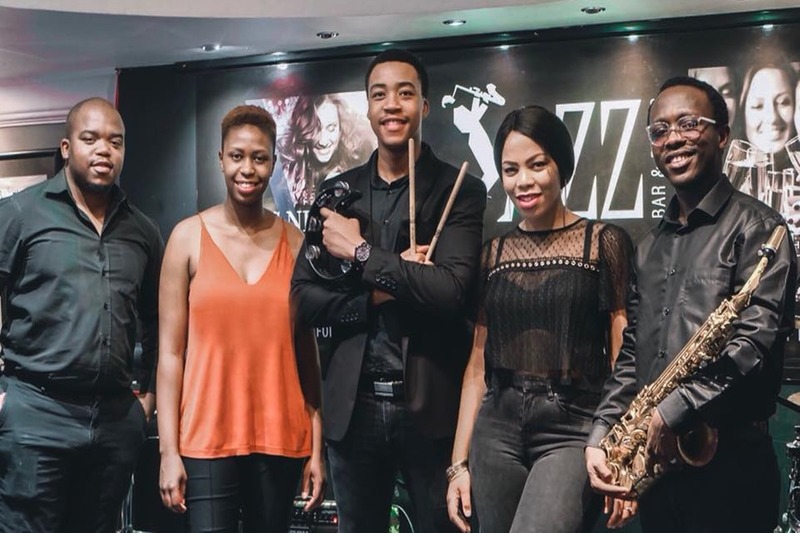 Abu Dhabi’s top live music venue, Jazz Bar & Dining, welcomes a new band to its stage – Blakk Velvet. Made of five multi-talented musicians from South Africa. Let’s get to know more about the residents: Mbali Siluma, Unarine Adoria, Obakeng Glory, Shadrack Fana and Mthobeli Malima. How did ‘Blakk Velvet’ come into existence? Share the story behind the formation of this band and its name. We met at each other’s mutual friends several years ago. We have extremely different characters that work very well together. There’s the calm one, the strict, the eccentric, the sarcastic, the introvert. The thing that brings us together is our passion for music. We’ve all got the same history of discovering our talent by ourselves and exploring this with different instruments and music styles. It’s this background that helps us work together as a band and offer a standout performance every time we get on stage. Is this your first time out here to play in the Middle East? Where else have you played before? We’ve played together for a long time in South Africa. Some of us have worked together for 10 years, others have at least performed with each other more than 4 years. Together, this is our first time in the Middle East although some of us have visited the region before, performing in Dubai, Qatar and Turkey. We’ve also been across Africa, the US and Europe. We think our style is a chutney of genres. We’re heavily influenced by gospel artists; it’s where we found our sound with the flexibility that style of performance allows. Growing up we met a lot of excellent street musicians, and that style has also found its way into our music. In South Africa, we explore through jam sessions and you can see that on stage. We rarely perform a song as it is. Sum up your musical style in a line? Contemporary with a flare of the soul. Feel good music. What has been the biggest challenge for you as a group? How did you overcome this? The biggest challenge as a band is the initial phase when you are settling in at a new place and to be able to gauge what our audiences like and how they are responding to us. How we overcome this is by taking more risk, trying newer music sets, bringing innovation to our music and improvising depending on the audience reaction. How do you like the crowd in Abu Dhabi? What songs never fail to get the Abu Dhabi crowd moving? The audience in Abu Dhabi is amazing! They really respond and engage with our music. It is a lively and fun crowd. Some songs that work really well are Hotel California, I Will Survive and Bailando. They’re either singing along or on the floor – and many times, it’s both! What's the best part of playing LIVE and how do you like your new residency? The best part is the energy you get from the audience. It is electrifying, and we feed off of that. It’s been great being here so far. We are really enjoying our time here. Have there been any disasters when you have been performing? Any funny stories to tell us? Well, no major disasters as such but it is always funny when one of us hits the wrong note or key, or if we forget the lyrics of the song. The audience never realizes as we do a good job of covering it up, but at that moment, it is always funny and hard to keep a straight face on stage. What can the crowd of Abu Dhabi expect from you as a band when they come to see you perform? The crowd can expect renovated music from us – music that is fresh, fun, has our own interpretation and flare. We also guarantee some dance moves and an overall good time.